Xiaomi has presented this week its Xiaomi Mi Drone, which will be available in two variants. One with a 1080p camera, and a more expensive version that allows video recording in 4K. Chinese brand Xiaomi is known in the technology market mainly thanks to affordable smartphones with good quality, and it seems that this policy now applies to the first drone developed by the company. The price of this quadcopter lowered to half that of its competitors: the cheapest costs about 340 euros, and the one offering better image quality approximately 410 euros. 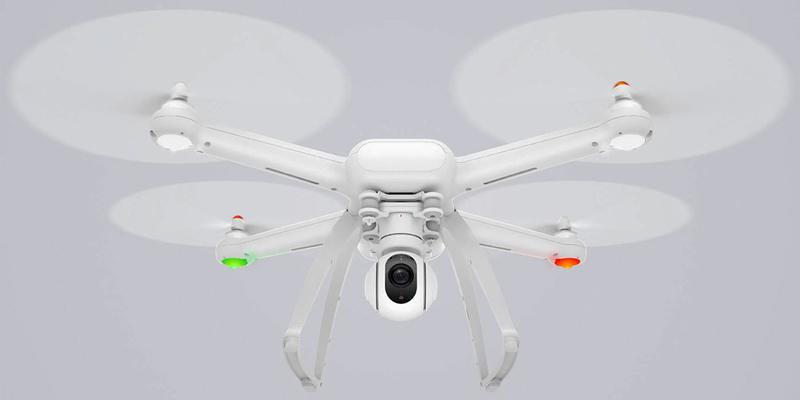 But because Xiaomi Mi Drone is a quadrotor with built stabilized rotating camera, we should compare it with other devices that have similar technology. The leader of the market today, the Chinese company DJI, sells its cheapest 4K camera drone for about 900 euros in European markets. On the other hand, the Mi Drone can fly for 27 minutes with 5100 mAh battery. Besides having a removable battery, another interesting detail is that the other individual components of this drone are replaceable. It also includes a universal remote control that can be put on a smartphone to enjoy viewing live video recorded by the drone. The range is up to 3 kilometers. However, one of the most notable doubts is still if this drone may be purchased outside Asia, as Xiaomi products often have to be imported from abroad. 4K camera Mi Drone has a resolution of 3840 x 2160 pixels at 30 frames per second, and can take images in RAW format. 1080p version filmed at 60 frames per second. The three axes removable stabilizer corrects itself, according Xiaomi, 2000 times per second. This drone can take off and land with a special button separately, which improves the use of those users who are starting on their use, and also lands itself when the battery is low. Xiaomi Mi Drone is today one of the most popular drones worldwide, despite ignored its fate today (unless its launch in China is scheduled for July). While it is true that Xiaomi is very popular in China, especially in the smartphone market, in Europe generally it sells more accessories such as headsets and other portable chargers than other kind of mobile devices.